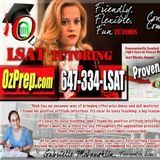 Welcome to OZPREP: Toronto's fastest growing and most visited** LSAT tutoring service!! Indeed, this ad is long... but an essential read for all LSAT students. For LSAT newbies to seasoned veterans, you've come to the right place. Our private tutoring firm is the best in the city -- just check out our VERIFIABLE reviews. Unlike the firms that tutor everything, the LSAT is all we do, all the time, all year round. That myopic focus ensures that our students SCORE LIKE NEVER BEFORE. ** Our site gets more traffic than all of Toronto's independent tutors combined. We get more Canadian traffic than many large, established firms such as Harvard Ready, Admitmaster, etc. ▶▶ After a few short years, OzPREP has grown into the largest most popular private tutoring firm in the GTA. (source: Amazon Alexa Webtraffic, (Jan 21st). What began as a part-time gig for a 2L student at Osgoode has--5 years later--blossomed into a professional venture that presents a powerfully effective alternative to the BigPrep companies that dominate LSAT prep. We'd confidently put our record up against any one of the big firms. Private Tutoring WORKS. Our fees often amount to less than the cost of those infamous (and monotonous...) Oxford/Kaplan/Princeton Prep Courses. In fact, over half our students come to us disillusioned AFTER paying large sums for these services ▶▶ for most, they are simply NOT worth the expense! These firms also offer private tutoring...for which they charge well over 50% more! Don't be duped by those making grandiose (and impossible to verify) claims... unfortunately, fake results and testimonials are everywhere in this industry. Even Google/Facebook/Yelp reviews are easy to falsify, not to mention random quotes and statistics posted on company homepages. As an example, Oxford Seminars claims "over 98% of our students recommend [sic] our LSAT courses to their friends." Faint echos of Zimbabwean elections and old-school KGB operations come to mind. You'll be paired with an experienced, approachable, friendly tutor having scored in the 90th percentile or higher... We like to stress that none of us are genius-types who scored 180 off the bat. While the big firms fight to the death to hire the highest scorers, we focus on being excellent LSAT TEACHERS. Is there even a correlation between the two? New students often arrive slightly intimidated...expecting a cold impersonal genius/John Nash-type. The thing is, we've made every mistake that you will--many times over--and we're able to clearly explain the methods and tricks we developed in order to eventually conquer the exam. We hire passionate, engaging and amicable types... people who have that rare ability to translate this extremely daunting exam into something accessible ...even fun! Our students actually look forward to their sessions...and in turn, we look forward to those amazing teaching moments when a student hits a new high score, or sports a proud grin as a difficult concept finally clicks in. We've built our reputation over 5 years, from the humblest beginnings in a YorkU dormroom... mostly through Kijiji and strong word of mouth. Once we take you on, we'll follow you through your applications, writing, and school selection. We'll be by your side throughout the whole stressful and arduous process. From cradle...to... gavel? How's that for a tag line?! Let's face it, LSAT classroom courses are both expensive, and really boring. Run by the big corporations, their stale pedagogy hasn't really changed in decades. High scorers are hired and thrown in front of a classroom of students, with almost zero educational training. Why bother investing in your instructors--after all, these 1L and 2L top students will invariably depart for fancy Bay Street internships. What incentive do these instructors have to be top-notch, accessible instructors? None at all, really. Furthermore, when did we all decide that top scorers necessarily equal top instructors?? We contend more often, the opposite is true. The best teachers had to apply themselves totally to a discipline, and necessarily make all the mistakes the average student will. With enough motivation, they learn to master their craft by developing strategies, formulating shortcuts, identifying patterns...thereby becoming fantastic instructors with truly innovative and effective methods. While there are surely some top-scorers who fit this bill, frankly, most of them found the LSAT...rather easy. We've heard stories of classes of extremely bright pupils reduced to tears by incredulous instructors. The LSAT is hard enough without your own instructor making you feel stupid. All that to say that the tutors we look to hire at OZPREP are the antithesis of the irascible-genius type. While we do insist on high scores, the 99th percentile-types must demonstrate a whole lot more to become an OZPREP Tutor. We want those who are innovative, passionate, and personable. While we are always honest in our assessments, we will NEVER make you feel inadequate or discouraged. ▶▶We believe at our core that the LSAT is completely learnable for those students who have reached this level. LSAC's reversal of their 3-strikes policy (they used to cut you off after three tries) just serves to reinforce our conviction. We like to say that we're both your cheerleader, and your drill sergeant. ▶ ▶In essence, if you fail, we've failed. ▶And we really hate to fail. ...So it doesn't happen often. --We make liberal use of highlighter colors, symbols, analogies, and other cognitive aids that can make the correct answer choice jump off the page! --Tried and true methodologies developed over years that SIMPLIFY (rather than complicate) the toughest sections of the exam; you won't find these in any book! -- Cozy environment with free Wifi, a charging station, Tassimo coffee bar, and LSAT materials stacked to the roof! For your security and to bolster you cashback/points/air miles, we accept all credit cards via SQUARE. Cash/cheques/e-transfers are accepted too (but no debit). Visit ▶ OZPREP..... to find out more. Respond to this ad or text 647-334-LSAT to schedule a free phone consultation.